These decadent pastries filled with praline and cream are like giant profiteroles, perfect for sharing. For this recipe you will need: a food processor, a piping bag, a star nozzle and a silicone mat. Preheat the oven to 220C/200C Fan/Gas 7. Line a baking sheet with baking parchment and draw 4 circles, about 10cm/4in across. Sift the flour onto a sheet of baking parchment. Put the milk, salt, sugar, butter and 80ml/2¾fl oz water in a pan and bring slowly to the boil over a medium heat, until the butter has just melted. When the mixture is bubbling, remove quickly from the heat, tip in the flour all at once and beat vigorously until it forms a dough that leaves the side of the pan clean. Return to the heat and cook over a low heat for at least 5 minutes. Leave to cool slightly, then gradually beat in the lightly beaten eggs, beating well between each addition until the dough is smooth and glossy. Spoon the dough into a disposable piping bag, and snip off the tip to make a generous hole. Pipe 4 thick rings approximately on to the circles (piping the rings in one motion). Lightly brush the top with the egg wash, then sprinkle flaked almonds over the top of the choux. Bake for 10-15 minutes, then reduce the heat to 180C/160C Fan/Gas 4 and bake for a further 10 minutes until they are well risen and golden-brown. Once baked, remove from the oven and immediately slice the rings in half horizontally and return to the oven to dry out for approximately 3-4 minutes. For the praline, melt the caster sugar in a pan over a medium heat until the sugar has melted to a caramel. Add the hazelnuts and swirl to coat the hazelnuts in the caramel. Carefully pour onto a silicon mat and leave to cool and harden (boiling sugar gets very hot - take care not to burn yourself). Once cool, pulse the praline to a fine dust in a food processor. For the filling, pour the cream into a large mixing bowl. 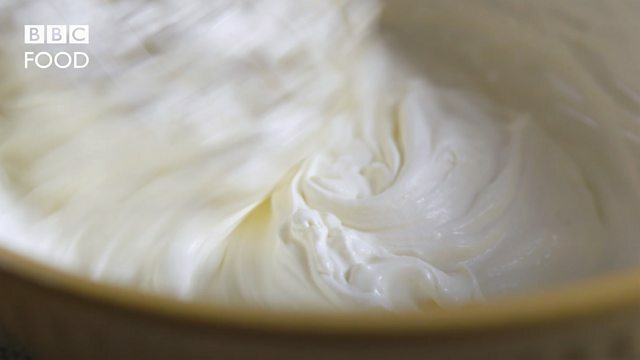 Add the vanilla seeds and whip until soft peaks form when the whisk is removed. Spoon into a piping bag fitted with a star nozzle. Sprinkle half the praline onto the bottom halves of the choux rings, then pipe a generous amount of cream over the praline. Sprinkle the remaining praline over the cream and place the pastry lids on top. Dust with icing sugar and serve.